Hopefully, you can stand one last story about El Niño. I work for Bay Metro Transit in Bay City, Michigan, and the long hot summer of 1998 was especially hard on some of our transit buses. Our 27′ buses are a front wheel drive unit, powered by a Cummins Diesel engine mounted below the driver’s seat. We were experiencing dozens of air conditioning compressor failures, along with various other problems due to the overheating. While this was happening, the manufacturer also realized it had a problem, and equipped all subsequent buses with a fan on the side engine cover of the bus that sucked the hot air out of the engine compartment, curing the problem. 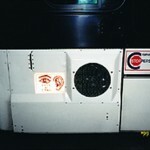 This, however, left us with the original 13 buses not equipped with the fan. My boss called the factory and was told the bare fan housings would cost $560 each and they would require extensive modifications to even fit our units. So I, always looking for a fun project and maybe a dollar or two, told my boss I could make them and would sell them to Bay Metro for only $450 each! After several minutes of uncontrollable laughter, my boss told me to get to work. Although I had been using WEST SYSTEM® epoxy for many years on various boat repairs, I had never mass-produced parts from a mold. Since the fan housing I was going to make was fairly simple in shape, I built a temporary mold using sheet aluminum, filling the seams and fillets with polyester filler. Once this was finished, I waxed the mold with three applications of car wax. To make a part, I first brushed on a mixture of 105/205 resin thickened with 404 High-Density Filler to the consistency of ketchup. After this tacked up, I applied two layers of 6 oz. fiberglass followed by two layers of 20 oz. 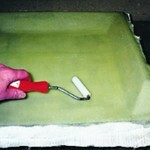 tooling cloth, using a plastic spreader and a Bubble Buster to work out the bubbles. When this was cured, I removed it from the mold. I then sanded, ground and trimmed it to fit on the bus as planned. After buffing and waxing, I used this perfected housing as the plug for my permanent mold. 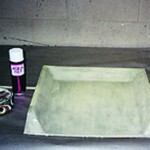 Again, using thickened 105/205 epoxy, 6 oz. and 20 oz. 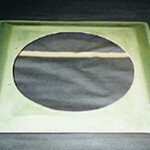 cloth, I formed the mold from the fan housing. When I went to remove the mold from the fan housing, I learned an important lesson about using the proper wax and proper post-curing. The housing had set for three days and I thought it was completely cured—I was wrong. 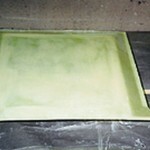 When making a part you can get by without post-curing; however, when you “lay-up” a part in a mold that is not fully cured, the epoxy may bond to areas of the mold, and the two are extremely hard to separate. I had made several small parts before and always used car wax. After a frantic call to the Gougeon Brothers technical staff, I was informed that all car waxes aren’t the same. Typically, carnauba paste waxes work well. Liquid waxes are not as effective. Of course, this time I had gotten the latter. After I managed to separate the mold from the fan housing, using putty knives, chisels, and much cursing, I made the necessary repairs and finished by sanding the entire housing with 1000 grit sandpaper. To post-cure, I then put the mold into my oven overnight, heating it to 100°F by a trouble light. A cardboard box will work just as well. The next day I buffed the mold to a shine and applied five coats of the proper carnauba mold release wax. Next, came a coat of super hold hair. After this dried, I laid up my fan housing exactly as I had before, using the 6 oz. and 20 oz. cloth. The next day I trimmed the edges off and, after a silent prayer, I popped the housing right out of the mold. It worked perfectly! On subsequent parts, I only applied one coat of wax and the hair spray. (I don’t think the hair spray was necessary since the parts came out so well; however, I wasn’t taking any chances.) I was able to produce one part every day. After cutting the hole for the fan and light sanding, I painted the housings with Imron™ polyurethane enamel, and assembled and installed them on the busses. Since installing the fans, we have not experienced any compressor failures and our overheating problems seem to be cured. Hmm, I wonder if I could interest my boss in a custom air intake scoop for the front of the bus? Let’s see 13 busses at $350 per scoop. Dan Witucki has been racing, repairing, and modifying sailboats in Saginaw Bay for nearly 20 years, including a prototype Soverel 27 and his current boat, an Evelyn 32. Most notably, he crewed aboard the vintage 1970’s Bounty II, VASHTI, in Bayview Yacht Club’s 1993 Port Huron to Mackinac Island Race, taking overall honors. Dan is currently the Commodore of the Saginaw Bay Yacht Racing Association and constantly promotes sailing activities in our area. He has also attended the Gougeon Brothers Boat Repair School. The finished mold…after a temorary mold, a prototype part, chisels, cursing and post curing. Laying up a fan housing wtih 6 oz. an d20 oz. cloth over a 105/205/404 gelcoat. I cused a plastic spreader and a Bubble Buster to work the air out of the fabric. 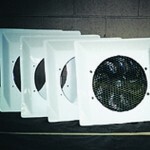 A fan housing out of the mold and trimmed. After my silent prayer, the housing popped out of the mold perfectly. A fan housing with the hole cut for the fan. I was able to produce one housing per day from my mold. 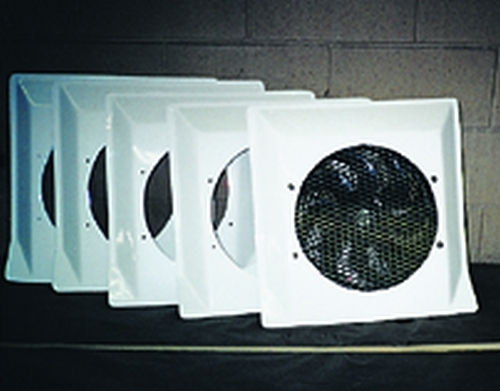 The finished fan housings, painted and ready for installation. A fan housing installed on a bus. Since installing the fans, we have not experienced any compressor failures and our overheating problems seem to be cured.